Even in the high point of summer, Lake Clear keeps its quiet woods and water nature. 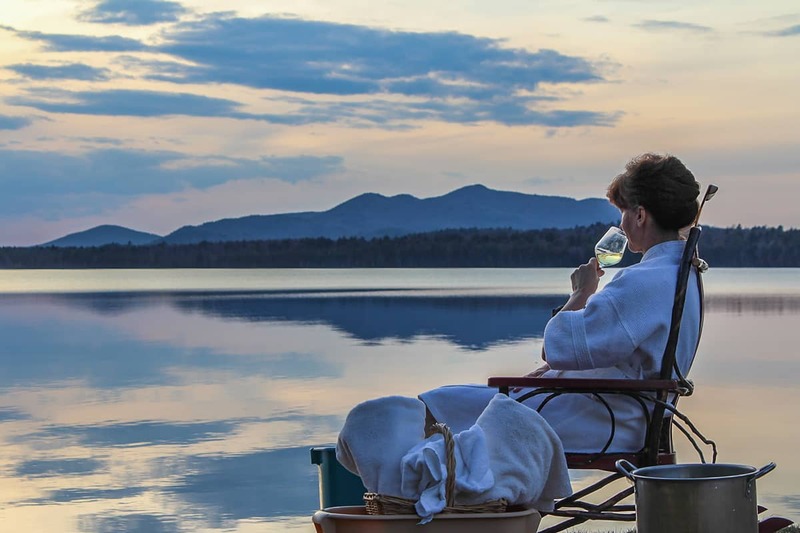 With no boat launch on the lake, it is often populated by nearly 2 dozen loons framed by one of the most spectacular mountain-lake sunsets you will find anywhere in the world. Interpretive trails, the ability to paddle into the window of NYS' only Wilderness Canoe Region and Great Camp Style Lodgings that are spread out over 25 acres in limited fashion close enough to say hello, far enough away to reflect. This experience also includes a Healing Woods Restoration Kit which awaits you in your artisan lodging and tickets to the Paul Smith's College Visitor Interpretive Center with a diverse set of exploratory nature programs. Discover with new world of Nutritional Energetics with three tips you can take home! Includes our Common Roots Cookbook, a balsam decorative pillow, incense candle you can use or take home, an Adirondack S'mores kit, and a glass of bubbly.